This was the pivotal moment in the history of one of Europe’s oldest cities which would propel it from modest national importance to being the richest city in Europe, a position that it would maintain for the next two centuries thanks to the monopoly of the Americas trade granted to the city by royal decree in 1503. This monopoly was regulated and enforced by the Casa de Contratación (House of Trade), which collected a 20% tax (the quinto) on all goods entering Spain, as well as other taxes and levies, and had to approve all voyages of trade and exploration, trade routes and the like. This information was updated and preserved in the Padrón Real, the official, and secret, map of the networks of Spanish trade and empire around the world, a major undertaking that employed Spain’s best cartographers. The casa also trained and licensed captains and navigators. From 1543 it worked in conjunction with the Consulado de Mercaderes, the Merchant Guild of Seville, through which most of the wealth from the New World was channelled. As the money flowed in the city began to acquire the trappings of wealth. The Cathedral, by some reckonings the largest church in the world, was completed in 1526, and the 1560s saw the addition of a belfry and a statue, the Giraldilla, representing Faith, to the Moorish minaret. In the Plaza San Francisco the city’s secular authorities were housed in a new town hall, the Casa Consistorial (1527-1564), usually known as the Ayuntamiento, with its ornate plateresque decoration and the arcade that gave access to the Franciscan friary which occupied the whole of what is now Plaza Nueva. In the later years of the century the Real Audencia, a court of the Castilian crown, was built on the other side of the Plaza San Francisco, with the Royal Prison on the corner of Sierpes street (the site is now occupied by a bank). Miguel de Cervantes, who wrote Don Quixote, was for a short time “a guest of His Majesty” here. From the same period are the Archivo General de Indias, built originally as the Casa Lonja or commodities exchange, and now the third of Seville’s World Heritage buildings, the Casa Moneda (Royal Mint), where silver from the New World was minted into coin, and the Hospital de Cinco Llagas (the Five Wounds), which is now the home of the Andalucian Parliament. At the same time many churches, monasteries and convents, as well as private palaces of the aristocracy and merchants all over the city were built or elarged. With that kind of money came not only lavish building projects, but patronage of the arts. Seville’s Golden Age came to its full fruition in the 17th century Baroque School, among whom were such luminaries as Francisco Herrera, Diego Velazquez, Bartolomé Murillo and Francisco de Zurbarán, as well as sculptors like Pedro Roldán and Juan Martinez Montañes (the God of Wood). Many of their works can be seen in the Fine Arts Museum and other museums around the city. Although work actually started on it before the discovery of America, Seville’s university, which grew out of the Dominican schools of the previous century, also belongs to this period, with Papal authorisation for its courses being granted in 1505. It was installed in buildings near the Puerta Jerez, where the street named for its founder, Maese Rodrigo, can still be found. All that remains today is the little Mudejar chapel at the end of the Avenida de la Constitución. In 1771 the university moved to another of the important buildings of the time, the College of the Annunciation of the Professed House of the Society of Jesus, and the Church of the Annunciation next door, on the corner of Plaza de la Encarnación, were both built in the 1550s. This explosion of wealth and culture has left a lasting mark on the modern city, as many of its buildings and artworks are still preserved, and can be seen on a walk around the city. For me, it’s possibly the most beautiful, fascinating, and culturally rich cities in the world. Calle Sierpes (Serpent Street) is the main shopping and commercial street through the centre of Seville, connecting Plaza San Francisco and the Town Hall at one end with the Plazas Campana and Del Duque at the other, and it’s one of those streets whose name is almost synonymous with the city where it is to be found. This relationship is a product of the many literary references to the street, most notably in the works of Cervantes (who for a short period was “a guest of his majesty” in the Royal Prison, which once occupied the site of the Cajasol bank on the corner of Sierpes and Entrecarceles streets). During Seville’s Golden Age (the 16th century, following Columbus’ discovery of America) Sierpes was notorious for the shady characters who gathered there, intent on making easy money from the riches generated by the trade with the new World. In early mediaeval times the area lay outside the city wall, and a branch of the Guadalquivir flowed through what are now the Alameda de Hercules, Trajano, Sierpes and Constitución (a Viking longboat was discovered beneath the Plaza Nueva), most of which was drained to make way for the expansion of the Moorish city in the 11th century. One theory as to the origin of the name Sierpes is that it’s because the street follows the winding, serpentine course of this old river. In the 15th century it was known as Espaderos (Swordsmith) street, for the great number of workshops of this type, only acquiring the name Sierpes afterwards, for reasons that are disputed. Apart from its winding course, the name may be derived from the Locksmith’s Cross, the Cruz Cerrajería, that once stood there, but is to be found today in the Plaza de Santa Cruz, which is embellished with snake-shaped ornaments. It is also said that it is named for one Alvaro Gil of Wurms, who had his residence here, or for a tavern called Wurm. Most popular, though probably not the most truthful, is the Legend of the Serpent. It is said that in the late fifteenth century children in the neighbourhood began to mysteriously disappear without trace. After months of anxiety, a man who would not give his name promised to solve the mystery and identify the culprit, but only if his request to be released from prison was granted. Alfonso Cardenas, the ruler of the city at this time, accepted the terms, and sent his clerk to get the details. The anonymous informant was one Argüeso Melchor de Quintana, a Bachelor of Arts from the University of Osuna, in prison for participating in a rebellion against the king inspired by the Duke of Arcos, who had later deserted him. Before the notary Quintana recounted how he had found the culprit. He had made a tunnel in order to escape from the prison, and stumbled on the Roman and Muslim underground galleries of Seville. In his flight, he ran into the child stealer, who he had killed before returning to jail because he did not want to spend the rest of his life as a fugitive. He then took them to the place, where they found the murderer already dead, with a dagger buried in him to the hilt, and the bones of the children around him. But the culprit was not a man, but a huge snake, which was presented to the public in Espaderos street, which thereafter was also known as “Calle de la Sierpe “. Quintera obtained his promised freedom, settled in Seville and married the daughter of Cardenas. After Cervantes knight errant Don Quixote, Spain’s most famous literary figure is surely Don Juan de Tenorio. The protagonist of countless poems, books and most famously of Mozart’s opera Don Giovanni, he is normally portrayed as a heartless womaniser and bragadoccio, and it as a notorious libertine that his name has passed into the popular imagination. In most versions of the story he comes to a much-deserved bad ending, being dragged away to hell by the statue of the father of one of the women he had tried to seduce, who he had killed in a duel. But was there ever any such person? The Don is often said to be modelled on the historical Miguel de Mañara (1627-1679), and both his birthplace in Calle Levies and the Charity Hospital La Caridad, where as senior brother he made his name for charitable work among the city’s poor, feature in Seville City of Opera’s Ruta de Don Juan. However, since Tirso Molina’s The Trickster of Seville and the Stone Guest, the first known literary work about Don Juan, appeared in 1630, when Mañara was just three years old, this connection has to be dismissed as a later fancy, possibly intended to discredit the brotherhood. There is a more likely candidate. In the 14th century a prominent noble family with the name de Tenorio lived in Seville (their house was on the site of what is now the Convento de San Leandro). During the reign of Pedro I “The Cruel” one Juan de Tenorio supported Henry of Trastámara in his bid to seize the throne, but was discovered and forced to flee. Beyond the name, there is nothing to suggest that the later stories were based on the personality or activities of the original, though they may have been intended to blacken the name of an opponent of the king, and to be a morality tale of the consequences disloyalty. Beyond doubt, though, the character of Don Juan is Sevillano through and through. The connection is celebrated with a commemorative statue erected in 1975 in the Plaza de los Refinadores. 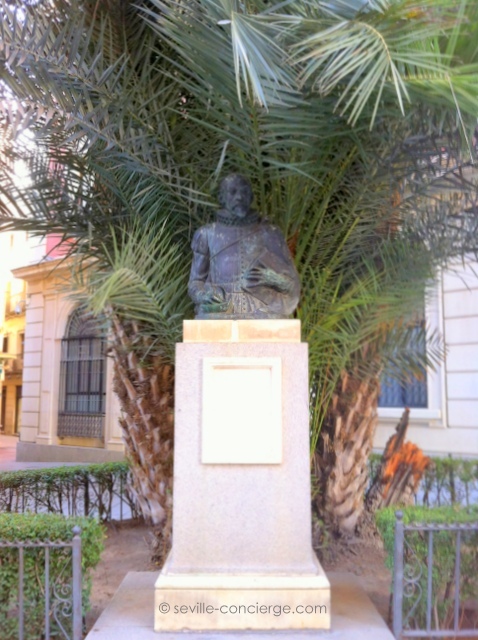 The Hostería del Laurel, which features in Zorrilla’s 1844 play, is in the Plaza Venerables, and nearby is the Plaza Doña Elvira, named for the only woman who truly loved him. In some versions she is called Doña Ines de Ulloa, and a family of that name is known to have lived in the Plaza in the 16th century. The tomb of the original Don Juan is said to have been in the Franciscan Monastery, which formerly occupied what is now the Plaza Nueva. If you are walking around Seville, and keeping your eyes open for the unexpected, you may see a plaque like this one. Miguel de Cervantes Saavedra is the Spanish equivalent of Shakespeare (and by one of those strange quirks of history, they both died on the same day, April 22, 1616), and everybody is at least aware of the tale of Don Quixote, and the images of the gallant knight tilting at windmills, his squire Sancho Panza and his bony horse. His other works are less well known, but many of the short stories in his Novelas Ejemplares were written while he was living in Seville, including a short stay as a guest of his majesty in the Royal Prison, and the plaques commemorate places around the city that were mentioned by him in the stories. There are seventeen altogether, mostly in the centre, but including one in Triana, and another in the gardens of the Buhaira. A full list (in Spanish) can be found here.